We continue to be amazed at the timely promotions on offer from top luxury hotels, but this one truly blows us away. 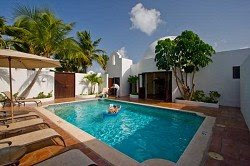 Book a stay at beautiful Cap Juluca on Anguilla and pay only for HALF the nights you are there! We agree, it sounds too good to be true. But trust us, it's not. Simply contact The EliteTravelGal today to book your Anguilla getaway for travel anytime between March 14-April 12, and the hotel will pay for every other night. Book through us and enjoy VIP perks including a priority upgrade upon arrival if available, a lunch for two at the resort's fabulous Blue Beachfront Bistro and daily continental breakfast served on your private terrace (or at Blue, if you prefer). For more information or to take advantage of this incredible deal, email elitetravelgal@aol.com or phone 310.979.9036. Why to make your nuptial journey more like a perilous voyage when hundreds of online match making web portals already exist for your rescue? Amid providing path breaking match-making alliance, a number of companies have come forward to encompass a self-perpetuating matrimonial service.